Conveniently located in downtown Burlington Ontario, The Gentlemen’s Hair Studio is an authentic, yet modern studio experience. Using an innovative approach that mixes old-style barber care with the newest modern techniques, The Gentleman’s Hair Studio provides an unforgettable experience. Blue Tide worked with Luk to develop a WordPress website design that conveyed their unique brand. 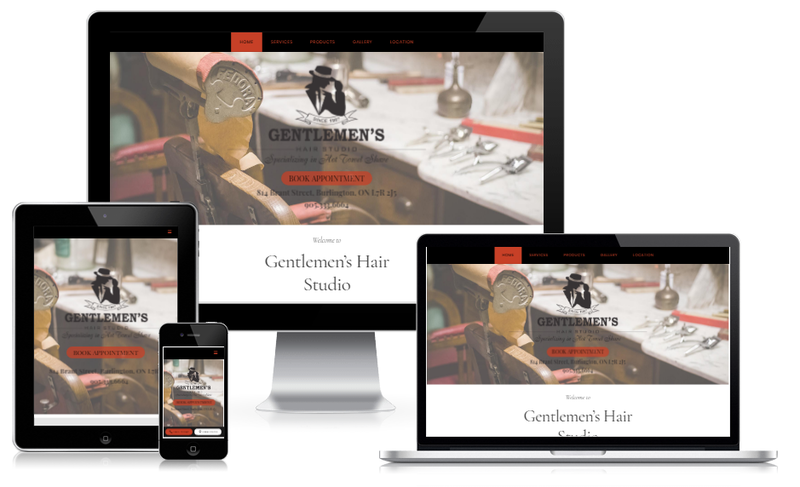 Using traditional colours with a mix of gritty black and white, The Gentlemen’s Hair Studio WordPress website provides a fast, convenient and easy web browsing experience while users review the website or book an appointment. Considering a new website or website redesign for your barbershop or hair salon? Give us a call to discuss website design options, easy online booking, local SEO for barbers or anything else you’ve considered from an internet marketing perspective. Call or text 416-889-7812 or use our convenient contact form to get more information.